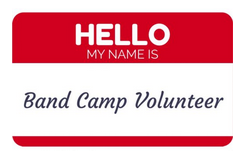 Volunteers needed for Band Camp! Band Camp starts in 5 weeks! Our students and directors need help in order to make band camp safe, productive, and even fun! Volunteers are needed to serve meals, maintain water stations, chaperone events, help at first aid stations, and more. Other than a willingness to help, no special skills are required. Thanks for your assistance and support! Pre-Camp is week of 7/23, Band Camp is week of 7/30, and Post Camp is week of 8/6. See schedule here on our calendar.